For a man who remains the only African coach to have successfully qualified two African nations (Nigeria and Togo) to the World Cup Finals, and helped Nigeria become the first country to win the African Cup of Nations and secure World Cup qualification, government’s handling of his funeral was at best shameful, and at worst an utterly disgraceful travesty. 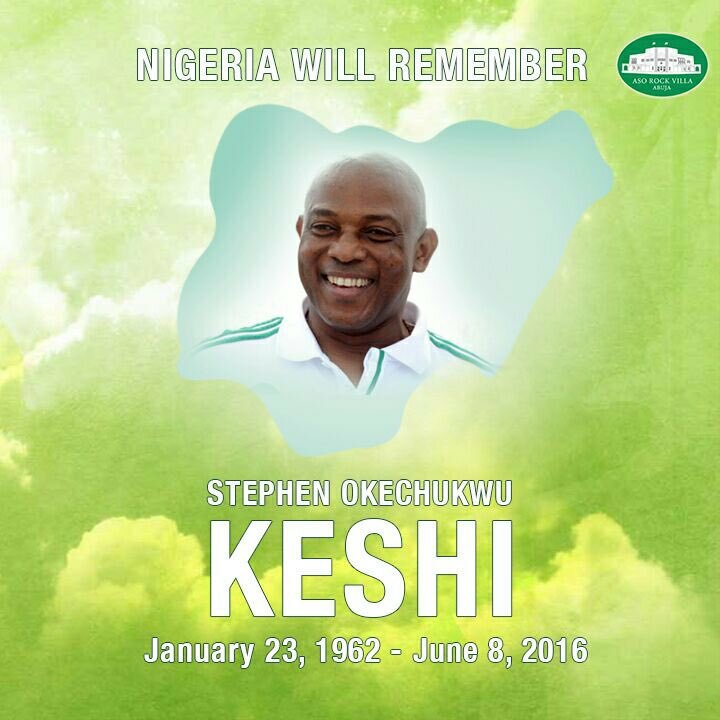 Stephen Okechukwu Keshi who made history as only the second person to have won the Nations Cup with his country as both a player and a coach was buried without the paraphernalia that should have accompanied the burial of the caliber of man and true hero that he was. The “Big Boss” as he was fondly called who played in five different Africa Cup of Nations, was captain of the national team at some point and manager of the Super Eagles recently was left in the lurch both in life and death. In life, he was constantly at logger heads with the administration of the Nigerian Football Federation and owed salary, and instead of getting some form of compensation in death, all he got were broken promises. It’s heart-rending. A disappointment, and a huge discouragement for anyone who plans to serve Nigeria faithfully in any capacity at all. Because the message is clear – Nigeria will abandon you in death. Nigeria is not worth dying for. Since Keshi’s burial on Friday, pictures from the funeral ceremony have gone viral, and not only that, they have been juxtaposed with pictures from the burial ceremony of late South African captain and Orlando Pirates goalkeeper, Senzo Meyiwa who was shot and killed in a robbery in October, 2014. And like the slogan once used by a popular soft drink brand, the difference is clear. Senzo Meyiwa’s funeral service which had more than 30,000 mourners ranging from ordinary people to cabinet ministers and football administrators at the Moses Mabhida stadium in Durban was a fitting farewell for a fallen hero. A far befitting ceremony than what was organised for Keshi whose achievements tower far above those of his South African counterpart in their lifetime. The Nigerian government reneged on its promise to relieve Stephen Keshi’s children and family members of the financial burden of burying the late legend and giving him the State burial he more than deserves. It’s one of the lowest of lows of the present administration. But beyond that, it’s an indication that there is very little to look forward to as regards things changing for the better in this country, however pessimistic that may sound. Past governments were in the habit of not living up to their word, and this government has proven so far that it is here to take the baton of deception and unfulfilled promises to the next phase. Till date, most of the houses promised to the victorious class of ’94 for winning the Nations Cup have remained a mirage. The family of the late Samuel Okwaraji who collapsed and died of congestive heart failure while playing for the senior national team of Nigeria in a 1990 World Cup Qualifier match against Angola about 27 years ago have all but given up hope that all the promises made to them upon the demise of the fallen football star by the government then will come to fruition one day. Apart from the forgettable attempts by former governors, Babatunde Fashola of Lagos State and Achike Udenwa of Imo State to immortalize the late football legend, very little has been done to keep Okwaraji in the memory of Nigerians. The list goes on and on. It took aeons for the government to do something about the plight of National Flag designer, Pa Taiwo Akinkunmi who lived in penury for decades until the previous administration placed him on a life salary. Legendary Rashidi Yekini who is unarguably the best striker to have ever played the round leather game for Nigeria practically lived as a recluse until his untimely death. And were it not for his former club, Victoria Setubal of Portugal who have been supportive of the plans to immortalize him through the establishment of a foundation in his honour by his daughter, the League Management Company over here would probably not have agreed to name the highest goal scorer award category of the Nigeria Premier League after him. The government of the day claimed it couldn’t afford the kind of burial befitting for Stephen Keshi because of the recession in the land, but that didn’t stop them from rolling out the carpet and committing huge funds to host FIFA President, Gianno Infantino and his entourage of 17 FA presidents who came visiting about the same time. It’s a sad reflection of the value placed on the life of the Nigerian. Billions are budgeted yearly to take care of former presidents who did nothing but loot our collective treasury and exacerbate poverty among the populace, and the current recession didn’t result in a cut in the N44bn budgeted for the State House and a reduction in the number of jets in the presidential fleet, yet a soccer legend who made history for Nigeria could not be honoured with a State burial. It’s hard to get over it. When patriotism is repaid with abandonment, it’s foolish to blame or criticize anyone who’s less than enthusiastic or downright refuses to represent or even be loyal to Nigeria in any way. Personally, I’ll be the last to knock players and athletes, especially who do not take calls to lace up their boots for the nation seriously. The body language of our leaders is as clear as daylight – Nigeria doesn’t give a hoot about you, and anyone who risks their life for the nation is entirely on their own. In a society where every man is for himself, that’s just the way the cookie crumbles. Real shame I tell you. Wow you sound serious today but but i can understand the frustration. It is the same way I feel too. If the president or anyone in his cabinet doesn’t see it as an urgency to be at the scene of herdsman killing or other disastrous scenes, there is no way in the world a football icon would matter to them because deep down in their hearts they don’t care. The way to look at it is…if they could treat someone like Stephen Keshi like this, then what is the hope of the “anonymous” John Doe out there? I have never seen such an emotionally dead government!… Anyway I won’t say am really surprised at the lack of concern for human well-being… What really still baffles me is how Nigerians blindly voted in this ‘change’! So sad…. Nigerians were caught between a rock and a hard place, and as much as this government’s performance hasn’t exactly been stellar so far, I am not sure pitching one’s tent with the last administration would have been the wise thing to do. Thanks Idowu. You can ask that question again and again!